The 23rd film in the Detective Conan franchise, The Fist of Blue Sapphire has made its long-awaited premiere in Japan. And it seems like this Detective Conan film has outperformed it’s last year’s 22nd film, Zero the Enforcer by dominating the box office record on its opening day. The film sold a total of 313,724 tickets earning 422,465,000 yen on its opening day, surpassing its previous opening day box office record. The film is also going head-on with the 39th Doraemon film, Nobita’s Chronicle of the Moon Exploration (#1 film that dominated the Japanese box office for straight six weeks.) and is aiming for the top of the Japanese box office. The film is set in Singapore and as the name suggests the story focuses on the “blue lapis fist” the world’s greatest blue sapphire, which is said to have sunk to the bottom of the ocean in the late 19th century. The story follows Conan meeting his rival Kaito Kid who brings Conan to Singapore against his will and must obey Kid if he wants to get back to Japan. They both try to steal the Blue Sapphire, which gets them involved in a murder case happened during the exhibition for the Blue Sapphire at the Singaporean Marina Sands hotel. The film is directed by Tomoka Nagaoka with Takahiro Okura handling the script. Katsuo Ono composes the music. The film’s theme song “Blue Sapphire” is performed by the vocalist Hiroomi Tosaka for Sandaime J Soul Brothers from Exile Tribe. 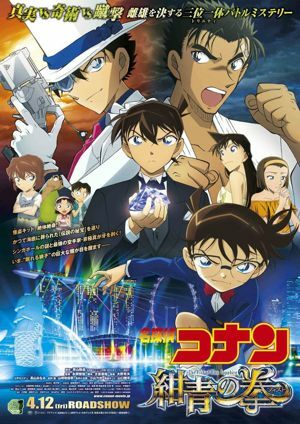 Detective Conan: The Fist of Blue Sapphire is a 23rd Japanese animated film of the Case Closed film series based on the manga series of the same name by Gosho Aoyama. Detective Conan: The Fist of Blue Sapphire was released on April 12, 2019.